San Francisco, CA, August 25, 2014 – Super Micro Computer, Inc. (NASDAQ: SMCI), a global leader in high-performance, high-efficiency server, storage technology and green computing will highlight its new Ultra Series high memory capacity 24x DIMM, NVMe enabled servers, 2U TwinPro²™, 4U FatTwin™ SuperServer, and storage optimized 6x HDD/SSD SuperBlade® solutions this week at VMworld 2014 in San Francisco, CA. These advanced server and storage solutions with VMware technologies are optimized for a wide range of virtualization applications. Headlining the event will be Supermicro’s 2U TwinPro²™, a VMware certified EVO: RAIL hyper-converged infrastructure appliance designed to accelerate deployment and optimize performance of virtualized environments. This scale-out solution features an optimal balance of compute, memory, storage and networking with redundant hot-swap Titanium Level, High Efficiency (96%+) Digital Power Supplies in a high-density 4-node, dual processor server appliance, simplifying virtualization across Enterprise, private/hybrid-Cloud, End-user computing and branch office environments. 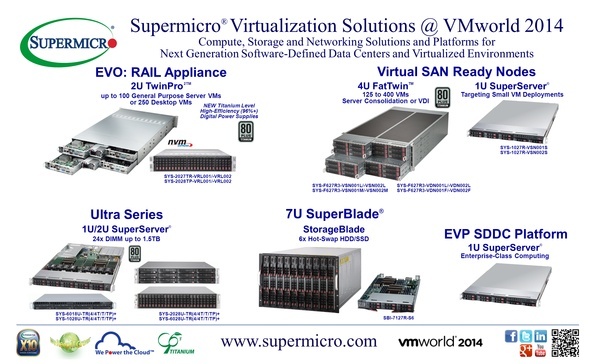 Visit Supermicro at VMworld 2014 in San Francisco, California, through August 28th in the Moscone Center, Booth #2217. For more information on Supermicro’s complete range of high performance, high-efficiency Server, Storage and Networking solutions, visit www.supermicro.com. Supermicro, SuperServer, TwinPro, FatTwin, SuperBlade, Building Block Solutions and We Keep IT Green are trademarks and/or registered trademarks of Super Micro Computer, Inc.
ServerWare® is SuperMicro Distributor in Malaysia. ServerWare® provides advanced hardware systems to cloud datacenters worldwide. Product lines include servers, storage, network switches, and integrated rack systems. ServerWare® customers want the same innovative cloud hardware technology in use by hyperscale cloud datacenter operators, but in off-the-shelf SKUs with global services. ServerWare® sells cloud hardware that delivers hyperscale performance, efficiency and advanced engineering, with flexible product configuration, rack integration, performance tuning and engineering consulting services to help customers deploy optimized cloud solutions for their unique cloud workloads.